Spartacus: Hollywood fact or fiction? “I’M SPARTACUS. No, I’m Spartacus …. and so is my wife”. So who was Spartacus? First of all I’m not talking about the TV series – which, what little I have seen of it, is a load of hocus pocus – but that’s only to be expected. I’m talking about the 1960 Hollywood film. 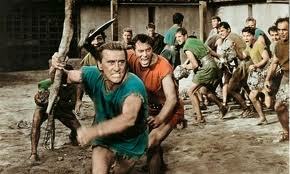 Did Spartacus actually exist or was he just a character of Hollywood invention to boost Kirk Douglas’ macho image? (see film trivia at the end for this latter observation). 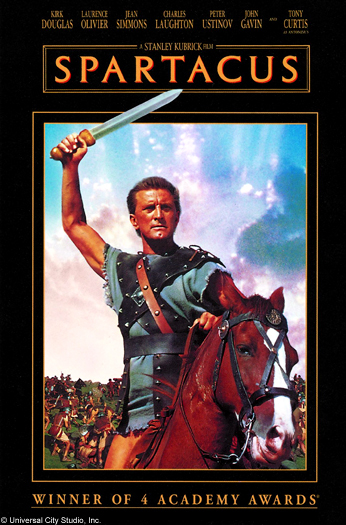 Admittedly the film was based on a novel, Spartacus, by Howard Fast (in fact, there have been at least five novels about him – Spartacus, not Fast) but, yes, Spartacus existed but he wasn’t THE leader of the slaves – there were at least two others, Crixus and Oenomaus, and possibly two more, Gannicus and Castus, but none of them had such a good PR agent as Spartacus. We have three main ancient sources of Spartacus: Plutarch (c. AD 46 – 120), see his Crassus; Lucius Annaeus Florus (c. AD 74 – 130), see his Epitome of Roman History; and Appian of Alexandria (c. AD 95 – 165), see his Civil Wars. According to these chaps, Spartacus was from Thrace (present day Bulgaria) and either an auxiliary in the Roman Legions or a captive from Romans wars around Thrace. Whichever, he was sold into slavery (for some misdemeanour if an auxiliary) and ended up training as a gladiator at a camp near Capua belonging to Lentulus Batiatus (wonderfully played by Peter Ustinov in the film). 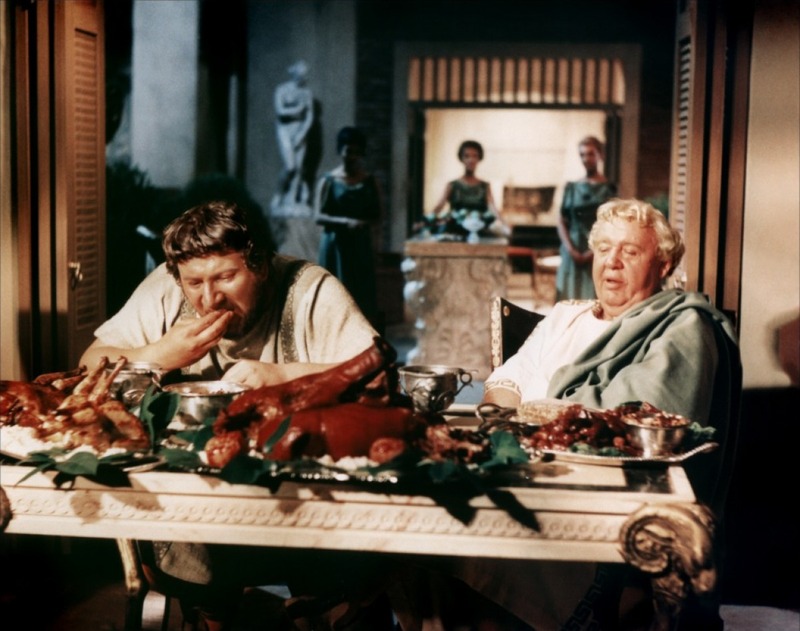 Peter Ustinov (Batiatus) and Charles Laughton (fictional Gracchus) – what a great pairing! 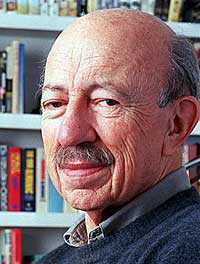 We have no information about Spartacus prior to his escape, so the film was ‘making it all up’ – well, Howard Fast was – Hollywood just followed. In saying that, Hollywood, of course, had a love interest in the film, Spartacus and Varina (played by Jean Simmons) and this is highly likely as gladiators were allowed female companions. What we do know for sure is that some 70 slaves escaped from the camp and, as previously mentioned, at least three leaders were appointed, Spartacus, Crixus (played by John Ireland in the film) and Oenomaus (sadly for him, ignored in the film – but he was probably killed early on in the revolt). The sources aren’t clear on the actual role of the latter two but both were Gallic slaves and gladiators. Nope, no documentary evidence of this fight. Aside: Of the types of gladiators, it is believed Spartacus was a murmillo who carried 35-40 pounds of arms and armour, wearing a bronze helmet, various arm and leg guards, large oblong shield and a broad straight bladed sword (a gladius – see the sword in the film poster above). 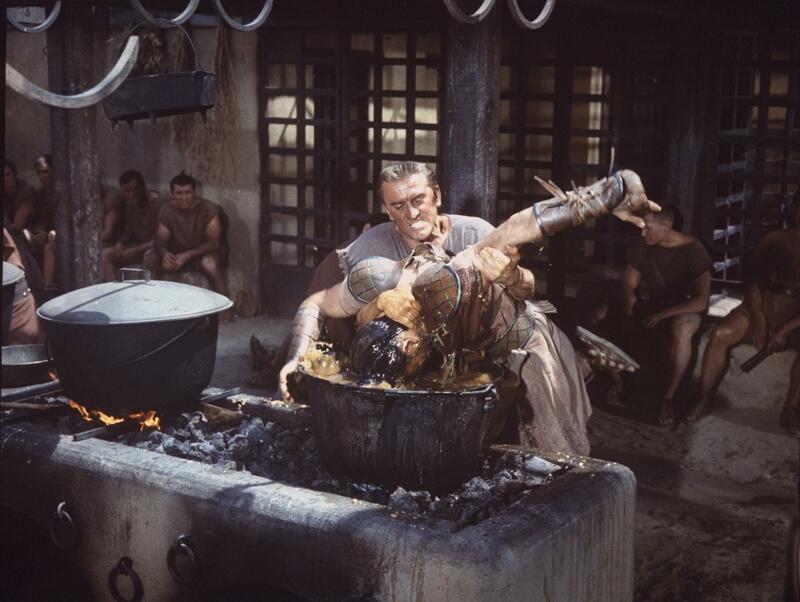 His opponent in the film (played by Woody Strode) was a retiarius who fought with a trident and a nest. In ‘real Roman life’ a murmillo usually fought a thraex who was also heavily armoured but had a short Thracian curved sword and a small round or square shield. A retiarius, usually fought a secutores who was very similar to a murmillo but with a special helmet to protect against the trident. Zliten mosaic AD 200: left to right: retiariuas (leg wound and broken trident on ground) fighting secutores; thraex fighting mirmillo; hopolmachus (with sword and spear) fighting mirmillo (latter surrendering to referee). The break-out from the Capua camp took place early in 73 BC. What followed was the Third Servile War (the other two were slave related, as the title may reveal, but nothing to do with this one). The gladiators began fighting for their freedom – just like the Texans at the Alamo, a few blogs back, remember? Actually, nothing like the Texans at the Alamo a few blogs back. This was really a fight for freedom. The Romans didn’t take the rebellion too seriously at first thinking it just an agitation that would soon be put down. They were wrong. Gaius Claudius Glaber was sent to crush the slaves and he besieged them at Mount Vesuvius (just south of Capua). Spartacus was a bit of a tactician (hence leading historians to believe he had had military experience) and he climbed down the mountain (not alone – with his army… ok) and took the Roman camp by surprise killing nearly all in it (I never said this was going to be pleasant). He then defeated another Roman force sent against him under Publius Varinius. By now his own army had swelled to around 70,000 (although we cannot be sure about any numbers). Rome was a bit embarrassed and in difficulties as most of its legions were away fighting in Hispania and the Third Mithridatic War (Asia Minor). What happened next, in Spring of 72 BC, is disputed by the ancient sources. 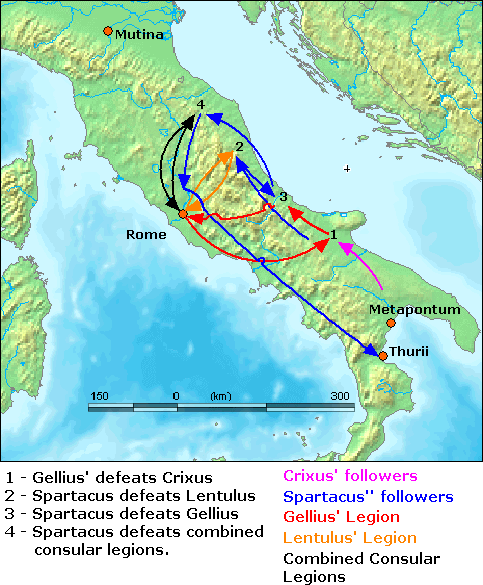 Appian suggests that Spartacus and Crixus split their forces and headed south to Thuri and Metapontum respectively (we assume Oenomaus is dead by now as he no longer gets a mention by the ancient historians). Then both armies turned and moved northward to march on Rome. If this is true, one can only assume the detour south was to gain more support. Crixus, with an army of 30,000 (or it may have been only 10,000) is defeated by a Roman force under Lucius Gellius Publicola near Mount Garganus (see map below). 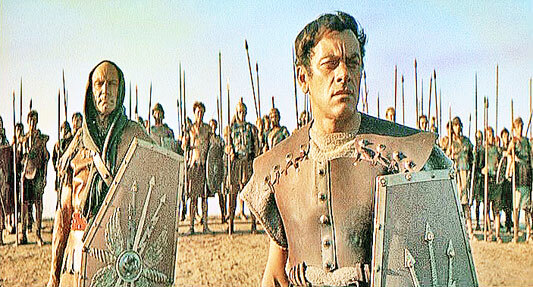 Spartacus arrived too late to save Crixus, who is killed (in the film he is killed in the final battle – John Ireland obviously had a good agent). 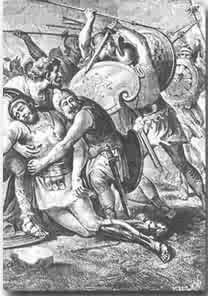 Spartacus then defeated another Roman army under Gnaeus Cornelius Lentullus Clodianus (known as Gnat the Clod for short perhaps?) and executed some 300 Roman soldiers to avenge Crixus’ death – I know, Kirk Douglas would not have done that. 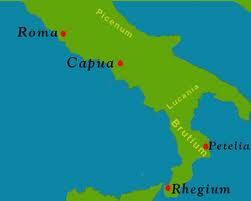 After a change of mind about an attack on Rome, he headed back south to Thuri with, by now, around 120,000 men (maybe). According to Plutarch, after his victory over Lentullus Clodianus, Spartacus headed north to Mutina (present day Modena) with the intention of escaping into Cisalpine Gaul. This makes some sense. Here he meets, greets and defeats an army of 10,000 under the governor of Cisalpine Gaul, Gaius Cassius Longinius. 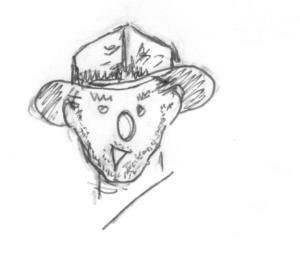 He and his followers are now free to ‘head for the hills’ – well, the Alps. However, for no explained reason, Spartacus and his crew turned around and headed south again. It may be that crossing the Alps was a too daunting exercise – but why head there in the first place? Spartacus may have been aware that Pompey’s legions were in Hispania and would be heading towards him in due course if he held up in Gaul. But he must have realised a confrontation with the Romans was inevitable. So, who do you believe – Appian or Plutarch? Or neither – perhaps they were both guessing. They were both writing several years after the war and relying on reports given to them and we don’t know how reliable such reports may have been. It really depends on what Spartacus’ motive was. Was he trying to escape or trying to cause as much trouble to the Romans as possible, or trying to end slavery (ambitious or what?!). We don’t know and never will, so not much point dwelling on it. 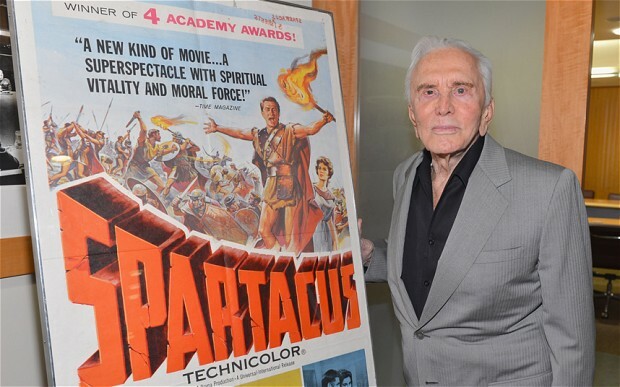 Kirk Douglas as a determined Spartacus – what was his motive? 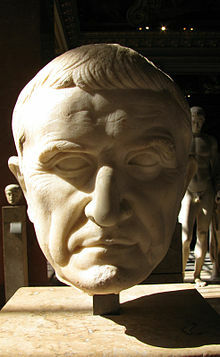 71 BC, enter Marcus Licinius Crassus (Laurence Oliver). He is given eight Legions (approx. 40,000 men) and told to sort out Spartacus & Co. By now the slaves are moving south and after several successful on-route skirmishes by the Romans legions, Spartacus set up camp at Rhegium (see map below). Here it’s possible (as seen in the film) he did try and do a deal with Cillician pirates (led by Herbert Lom in the film) to transport his motley mob by ship to Sicily, but he was betrayed – the pirates took his money and ran. Spartacus broke out of the, then, besieged camp and headed to the mountains of Petelia (present day Strongoli) near Croton (see map below). 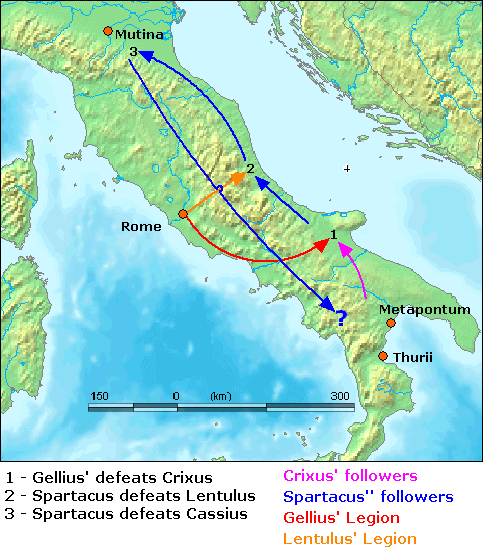 The rebel force must have have split at some stage (possible dissension in the ranks) and a group under Gannicus and Castus was defeated at Cantenna (modern location unknown) by part of Crassus’ army. Crasssus then turned on Spartacus and the latter soon realised that a fight was inevitable. We don’t know how many men there were in the rebel army but an estimate of around 30-40,000 may not be far off. It’s not entirely clear where the final battle took place – see map below, but there is another belief that it took place further northwest, at Senerchia/Caposele, in Luciana, evidenced by archaeological finds of armour and weapons. Take your pick! However, the slaves were defeated and the ancient sources say the Spartacus was killed in the action but his body was never found. Some 6,000 surviving slaves were crucified on the Appina Way (the road from Rome to Capua) as an example to rebellious slaves, but there is no suggestion that Spartacus was one of them (and, sorry, Tony Curtis’ character was Hollywood fiction). In the film, it is suggested that the main reason for the defeat of the slaves was because Crassus was reinforced by Pompey and his legions coming from Hispania. It was true that Pompey was on route but he was not involved in the final battle (trivia: filmed in Madrid). Crassus knew he was coming and so had to defeat the slaves before he arrived otherwise the credit for victory would go to the reinforcing general. Pompey did arrive in time to wipe out some 5,000 fleeing slaves. He kindly gave Crassus the credit for winning the battle but he (Pompey) took the credit for ending the war by wiping out the remnants of the slave army. Generous or what?! Needless to say, Crassus was none too pleased and they weren’t to be best pals. 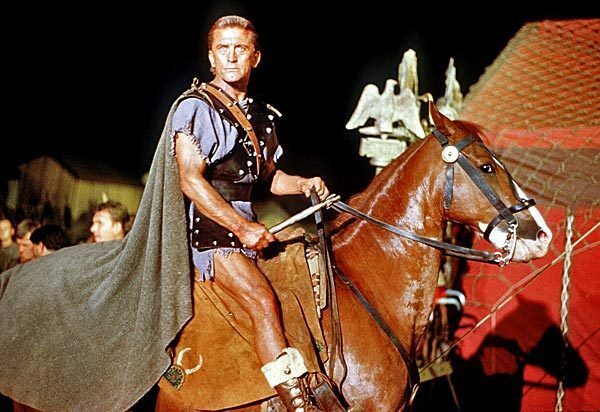 Film trivia: Kirk Douglas was intent on making the film because he had failed to get the lead part in Ben Hur (it went to some Heston chap). Douglas was executive producer and had to hurry to find finance for it because Yul Brynner was also planning to make a film about Spartacus. Universal Studios only gave Douglas the money once he had persuaded Laurence Olivier, Charles Laughton and Peter Ustinov (no one knew who Tony Curtis was then) to appear in the film. Good reason as any in 1960. Kirk Douglas in 2012 – not bad at 95! My good friend Hamish McCondor had a goodly quantity of fine vintage port which he took esteem pleasure in consuming in not too delicate quantities. I am pleased to report that, occasionally, he would share a glass or two with my good self. Well, my poor colleague took ill and his doctor ordered him off the port. Weeks went by and Hamish’s health began to seriously fade and so his doctor suggested that he had better take up the port again.